When ordering highly detailed vinyl decals, sometimes you can run into issues with the decal when removing backing from vinyl. Monograms with dots can also see more issues because there are so many pieces to keep track of. The first thing you want to do is…be patient. Next, move slowly. When you are removing backing from vinyl, you will want to really rub the decal from the top side. There are tools vinyl users have for working with vinyl, however if you are a beginner or someone who just wants to apply a decal to a Yeti, use a credit card, pampered chef scraper, etc. Just choose something that will not damage the decal. Once you have rubbed the top of the decal, flip the decal over so the decal is face down and peel the backing from the transfer. If you try to remove the transfer from the backing transfer side up, there are typically more issues. Simply bending the backing away from the decal should work. If you find there are pieces that are sticking to the backin, fold the backing in half while you are removing it, creasing the backing while working. 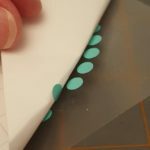 If there are any pieces still stuck, lay the backing back over the piece and scrape the backing with your finger nail to better adhere the vinyl piece to the backing, then proceed. It is really important to make sure that the vinyl is coming off before continuing removing backing from vinyl. If any pieces remain on the backing, it can cause the vinyl to tear or stretch as you remove the backing further on the decal. 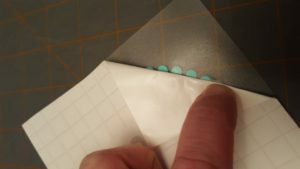 If the vinyl is still sticking to the backing, as you remove backing from vinyl, when you see the very leading edge of the vinyl lifting, you can flick it with your fingernail to the transfer. 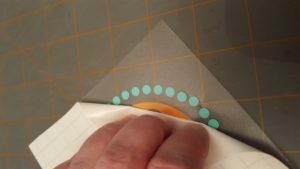 You don’t need to, nor should you, make contact with the adhesive on the vinyl to do this, you are just releasing the very edge of decal from backing. Vinyl is also a little more difficult to work with if it is cold. If the decal has been in a cold environment, let it come to room temperature before trying to remove vinyl from backing. This can be the case if you just brought the decal in from the mail on a cold day or in the heat of summer if it has been in a air conditioned house. Most of the time when you are rubbing the decal prepping it to removing the backing, the friction is enough to warm it up to easily work with it. In some cases you will want to warm it up just a little and this can be done simply by placing your hand on the decal for a few seconds.